June 29th … a significant day in our family all round. We commemorate a birth, a marriage and a burial. Life covered. It is the day that my Sister was born. How wonderful it is to have her close and to BE close. She is an amazing, wonderful woman. She has said that I am the kite & she is the anchor. It’s true – I cannot begin to imagine where I’d be without her. Happy Birthday, Pauline … you ARE my anchor indeed. I admire, respect and love you always. On this date, I said a final goodbye to my Brother. Rest well in the arms of the angels, my sweet Bud. I never stop missing you. 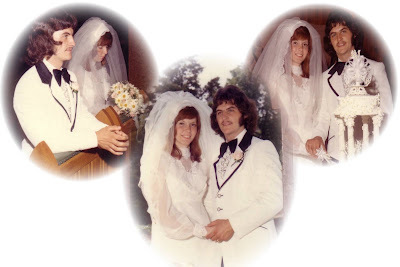 And on this day, 35 years ago, I married my love. A man who has kept me entertained and made my life an adventure. Of his romantic and eloquent proposal, I remember one sentence most clearly: "I want to grow old with you. ", he said. Of course, at 19 we really didn't expect that would happen - or certainly happen quite this quickly. Of our wedding, one particular sentence is also etched deeply in my memory. "May you see your children's children." It was when we were kneeling, in the photo above. I remember so clearly at that moment more than any, wondering what the future would hold for us. The greatest blessing of our marriage truly is our wonderful family. We have indeed got to see our children's children. But again, I didn't expect that it would happen quite so quickly either. Lots behind us, but so much more ahead. The best scenario continues to be that we are getting to grow old together and enjoy our children & our children's children. Happy Anniversary, Brian - you are my light, my life and my love. A friend recently asked a lady who had celebrated her 100th birthday, what the biggest or most surprising change she had witnessed in the world in all her years. One would have expected her to make reference to communication, TV, the internet or such. She said: 'Two things. 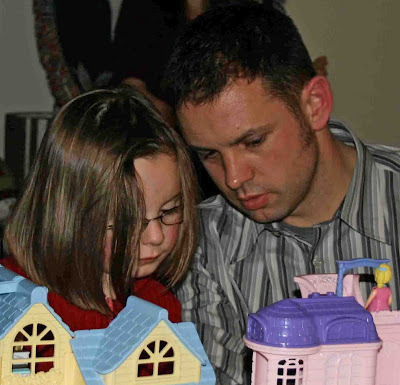 People are more tolerant than they were, and the involvement of fathers in their children's lives.' A thoughtful, thought provoking answer. Indeed, for the most part, it seems that the Dads of today are just as active in all areas of their children's lives as the Moms are. In general, our generation were more involved than our fathers in day to day care, and now this latest generation is even more hands on. 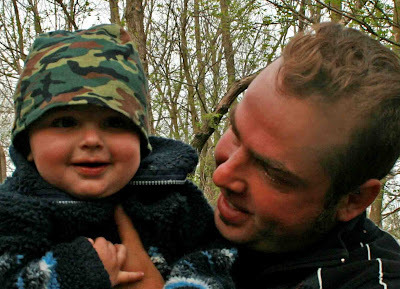 Both my sons-in-law are wonderful fathers. There is nothing that my girls do with the children, that they can't or don't do. Ash tells me that she has hardly ever bathed Gibs at night - that's Father-Son time. When Jae got home from Newfoundland, Nick had the house spotless, the lawn and the laundry all done and the kids happy and content. It's a blessing for my daughters, for my grandchildren and for the guys themselves, as they build close and loving relationships. ALL of their lives are richer for it and it most certainly is a wonderful thing to witness. It's always cool to discover something new at my age and then to find that others who are older & have lived in that area weren't aware of it either. Recently, while sitting up amongst the trees in Newfoundland, enjoying the view of the sea with friend, we witnessed a big puff of yellow smoke' in front of us. We both wondered if we imagined it, then suddenly it happened a few feet away again. And again - all around us there were 'puffs' - like explosions. 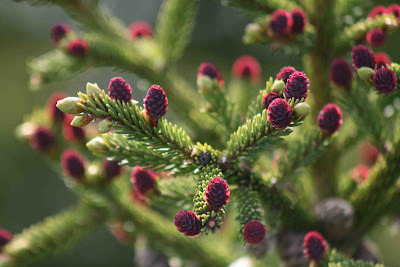 In going closer to see what it could be, we bumped one of the beautiful spruce trees that were laden with gorgeous magenta spruce buds (which had caused me to make a trip home for my camera). The bump caused a mini-explosion, which solved the mystery - it was clouds of pollen that we were witnessing. 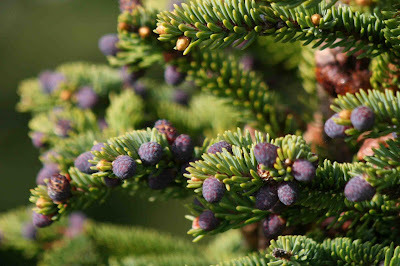 It wasn't evident anywhere on branches or buds - never did figure out the actual source as the buds were clean & crisp. Earlier that day, we had noticed a gross yellow sludge. In fact, Brian wondered if I had dumped yellow paint into the water. As if. I pointed out that it was thick, all around the entire coastline of the harbour. It was the pollen - obviously HUGE amounts of it. I mentioned it to a local later that evening and she was just as surprised as we were. She said that she'd never heard of it or seen it before that day and was relieved to know what it was too. She said 'All day, when I was looking out my window , I thought that there were forest fires starting with huge puffs of smoke coming the from trees - I even mentioned it to my husband.' So ... it just wasn't the 'newbies'. It was interesting how the entire forest was pollenating at the same time - must have been 'Pollenation Day'. Late this afternoon, as I sat on the back porch, I spied a beautiful doe and her fawn in front of me in the field. Knowing that any sound would sent them fleeing, I didn't go for my camera & try to capture the moment, I simply sat there and enjoyed it. These deer aren't them ...I took these a few weeks ago. When I look out and see the donkeys intently staring at something, I look for deer. If you click this picture bigger you can see what I mean. A few weeks ago, they were all lined up along the fence, and sure enough, about fifty feet away, there were two lovely deer, calmly laying down in the field, enjoying the sunshine. Another day, there was a big buck drinking from the pond. A glimpse of a deer in our field is such a treat. We see them more often than we used to in fact we never saw a single one for 15 years - now it's fairly often. At night though, it's a whole different matter - you really have to have your wits about you. Last night I had Ashley as my extra eyes - something you really need here anymore. In a very short distance, we came across three deer, three raccoons and a rabbit. Definitely NOT the time to be 'enjoying the moment'. 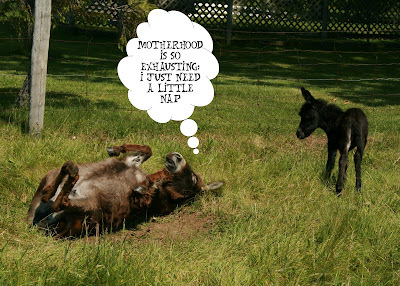 As I mentioned in my Easter Sunday post on April 12th, our donkeys tend to come into our lives on a significant day. Sure enough, this darling wee babe arrived on my brother, Bud's birthday - June 12th - I wrote about him in the April 14th post, 'My Buddy'. A pure black baby is really rare for us ... I think we may have had only one in the 25 years that we've been raising donkeys. This little guy is so black, I think I'll call him Cole. 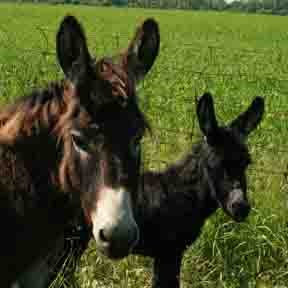 As I expected, my dear friend who Abby-sat & Donkey-sat, was not the least bit uncomfortable out here in the country. In fact, being here for the arrival of this precious babe, she officially became his ‘Godmother’. It was nice to come home to a new little jack, healthy and happy and running around like crazy. This is Pete, checking out his new competition. As he’s only 8 weeks old, you can imagine how petite Victoria (the Mom) is. And yes … she happens to have been born on Victoria Day. So there I was, camera in hand in one of the most incredibly beautiful places in all of Canada, and what do I photograph? A sight that I can see in my own backyard. Or front yard. Or side yard. Or any field and ditch for miles around. I guess what that says to me is that it doesn't really take all that much to inspire or amuse me. It's a fact that I'm just as attracted and amazed by the simple and common as I am to the spectacular and magnificent. Dandelions and icebergs actually have far more in common than you might think. They both appear at this time of year, for a relatively short time. There are people who really dislike the dandelion ... and some of us who herald its arrival as solid confirmation of spring and new life. It's hard to imagine, but icebergs pose an irritation and inconvenience to some as well - to those whose harbours get blocked or nets and traps get destroyed. There are people for whom icebergs are so common and such an ordinary part of life that they don't oooh and aaah and get their get camera out when they see one. AND ... they both are used for making wine. You can actually have wine made with iceberg water shipped right to your home from Aukland Winery in Twillingate. They're also both very fleeting - here one day & then a wind comes and blows them totally out of sight, and all they are is a memory of Spring Past. 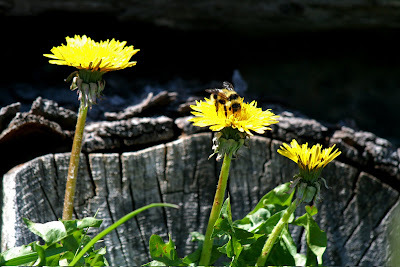 I found it interesting ... while the prime-time flower appears to be exactly the same, the mature Newfoundland dandelions look like they have thick little fur coats on, where our Ontario variety- wispy, fragile little things, only take a half of breath to dissipate. Are dandelions, when you actually look at them closely, and think about how that tiny wee seed can sprout in the most adverse conditions, any less amazing than a big hunk of ice? I love Spring. I love Dandelions. And Icebergs. And Ontario and Newfoundland. I love my home Here and There. And my friends Here and There. Travelling back and forth between the two makes me look at things closer and savour it all with a greater depth and appreciation. Perhaps one day I'll make some Dandelion Wine with Iceberg water ... I shall call it DandyBerg Whine ... I want it ALL to last longer! There are a multitude of beautiful scenes and remarkable vistas out here in Newfoundland - a photographers paradise indeed. If I were to get to choose only one to keep my spirit fed while I'm away - one that sends a wave of nostalgia over me whenever it comes to mind and makes me stop dead in my tracks each time I see it, it is the full moon on the harbour. We've watched the moon growing each evening, with great anticipation. The reflection on the water is so brilliant, so breath taking, so seared into my memory. It is one of those things though, that you cannot possibly capture. Breathtaking in real-time, it just doesn't begin to translate on to film. You just have to be here.